Is it possible to prevent duplicacy between two fields? Is it possible to somehow prevent duplicacy between two fields ? and I want to user to fill two different values and not same ? Can I achieve this, without actually submitting the form ? Here the user has to fill the same email address again. How can both these be achieved through JotForm ? In order to prevent duplicate fields for two different fields, you may use conditions to check the values. Here I'm displaying a Text field as an error message and hiding Submit button to prevent the form to be submitted. 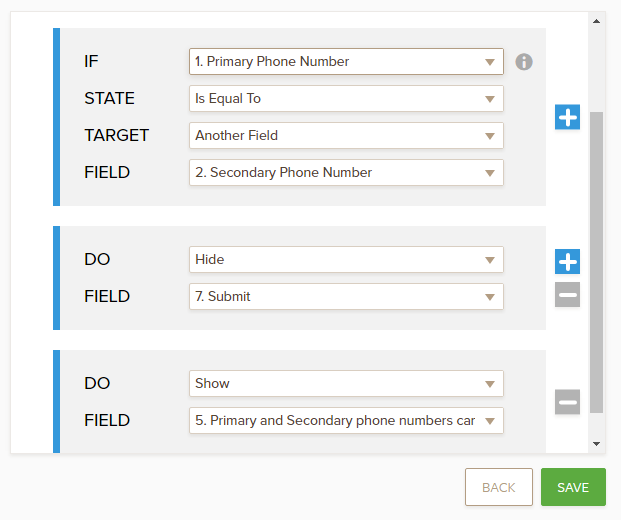 Please note that the State option in the conditions wizard changes from field to field and "Is Equal To" is not available when the field type is a phone number field. However, you may use a Textbox field for a phone number. It is similar to check if the two fields are not matching. If you want to check the email address, the confirmation field is already available in the field properties. You may enable the Confirmation option from the Email field properties in order to display the confirmation field.